Weekend Coffee Share… 5th August, 2018. This week, I’m a year older and wiser, after celebrating my Birthday on Monday. I’m not going to get into the specifics. However, I can still claim to be in my 40’s, although I’m now hanging on by my fingertips!!! My birthday was fairly low key. The kids went away skiing at Perisher with the Scouts, and my husband and I stayed home. From memory, we crashed out most of the time and slept. It’s still Winter here and I’m still inclined to hibernate. That said, we’re now starting to head into t-shirt weather by day, although it’s still pretty cold at night. Just to put you in the picture, it was 9-19°C today. 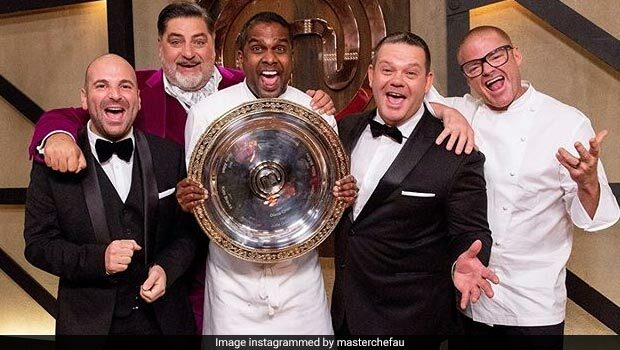 Last Tuesday night, was the Finale of Masterchef Australia 2019. Have you ever watched Masterchef? You guys come from all over but the show seems to have something of a global audience. I’ve been a diehard, loyal fan since it first appeared 10 years ago when Julie Goodwin became Australia’s 1st Masterchef. Given how much I’ve always loved cooking, especially baking, it’s no wonder I love the show. However, I don’t just watch it as a cooking show. Rather, I’m lured right in, watching the highs and lows, the conquests and defeats of the human spirit. While I’m sure all these contestants are perfectionists by nature and extremely driven, making mistakes on the show is par for the course. The key, however, is not to have two bad cooks in a row, because that’s what sends you home. I made no secret at home, that 19 year old Jess Liemantara was my favourite, although as she faced pressure test after pressure test, it didn’t seem likely that she was going to last the distance. However, she eventually survived long enough to place fourth…a great achievement. The finale saw Ben and Sashi fight it out. While Sashi had been a strong contender throughout and an obvious winner, his form dropped back a bit in those last final cooks and I thought Ben had the title in the bag. However, it wasn’t meant to be, and Sashi romped home with the largest score in Masterchef history. I’m not much of a TV watcher, but I’ve been left feeling a distinct void since Masterchef ended, even though it’s clearly time I caught up on my violin practice which has been an unfortunate casualty. I’m also waiting on the transcripts of the bigamy case I’ve mentioned a few times. My 3 x Great Grandfather, John Johnston was convicted of bigamy in New Zealand in 1864 and I’m waiting on them to arrive before I do more research on that front. Instead, I’ve dug up my research on my grandfather’s second cousin, Asher Hart, who was a swimming champion during the 1930s. However, in 1932, he contracted polio and spent four months in Sydney Hospital in plaster. I didn’t expect Asher to rise from the horrors of polio and certainly not return to competitive swimming and being a lifesaver at Sydney’s Bondi Beach. However, slowly but surely he got back on his feet and into training and his father, Reg, massaged his legs every night for 18 months. He didn’t throw him back into competition either. Rather, he valued rest as much as training and instituted what seems to be a pretty level-headed training regime. I’m still nutting out all his various achievements. However, in 1938 a mini tsunami hit Bondi Beach and hundreds of people needed to be rescued. Moreover, most of them couldn’t swim. Five people drowned that day, but Asher Hart saved four lives. I am so proud of him. Not just because he’s family, but because I’ve also survived the horrors of debilitating illness and for him to be able to do all of that, blows me away. I’m in awe. Indeed, when I first put the pieces of his story together five years ago, my muscle disease had flared up and I had my own questions of whether I was going to get my own muscle strength back, along with very real concerns that my lungs were steadily turning into concrete. I needed a hero. Not any kind of hero, but someone who was where I was at and climbed out. I’ve recently found out that he didn’t recover full strength in his legs, but his arms and shoulders compensated. He was certainly an extraordinary man, and from what I’ve also read, his character was equally inspiring. I am yearning to find out more. Speaking of which, I read a fantastic book this week: My Australian Story: Black Sunday by Evan McHugh. It recounts the story of “Nipper” a 12 year old Bondi lad who is desperate to become a lifesaver. However, it is 1938 and back then you needed to turn 16 and get your Bronze Medallion before you could join up. However, keen as mustard, Nipper starts training, swimming in the surf. The story goes off on many twists and turns and doesn’t just focus on Black Sunday itself, but provides more of an overview of what it was like to grow up and live in Bondi Beach at the time. It also places it within its historic context of the Great Depression, and the rise and rise of Adolf Hitler as the world steadily marches towards another world war. One of Nipper’s friends was a Jewish regugee from Germany. I found it a gripping, easy read and couldn’t put it down. Read it in a day. Highly recommend it. However, life hasn’t been all about reading during the last week and indulging in Masterchef. Today, we helped one of my support workers move house. Her situation was untenable and she needed to move in a hurry. I rang a friend from Church with a van and trailer and recruited my husband and son and off we went. It’s not easy to move in a hurry and while I kept myself pretty light when I was in share accommodation, she had the full kaboodle and was moving to a first floor flat with a narrow staircase. So, the guys hoisted the bed up over the balcony and my dear son proved himself a man and quite a rock helping without complaining and doing what needed to be done. Our team of men, and our friend’s son, showed how male strength can be used for good and make a difference. I was not only very proud of them. It touched my heart. I was really thrilled we pulled off the move because it’s not easy for me to help other people in practical ways with my health issues and just this once, we pulled it off. I was able to be the sort of person I admire and want to be…a helper and not a drowning soul myself. I have grown so much stronger. In terms of what I’ve posted this week, I did my usual contribution for Friday Fictioneers. This week’s contribution was : Secret Shed Business. I also posted a newspaper clipping I came across of my grandmother, concert pianist, Eunice Gardiner. I’ve never seen this photo before, but it showed my grandmother carrying her first son in a backpack and talking about how she attaches the baby on the front to go to the shops. Meanwhile,all in the same breath, she talked about giving a Beethoven recital at the NSW Conservatorium of Music. The baby was three months old at this point. My grandmother was something of a superhuman, although she didn’t go it alone. She had considerable support, despite my grandfather being away with the Army. In was 1943. The Japanese had already knocked on Sydney Harbour. These were very difficult times and yet she played on. Lady with the pups when they first arrived a year ago. Lastly, I just thought I’d finish up with a bit of a tribute to the dog. It seemed everywhere I turned last week, people were caught up in serious trouble and needed an ear. Indeed, I was starting to wonder if there was anybody who was feeling on top of the world. That life was good. By this point, my own gear had moved into neutral, the observer…it’s an easy place for a writer to sit and turn into something of a home. Then, I looked up at my dogs…Lady, the Border collie x Cavalier and Rose and Zac our year old Border collie x Kelpies who are brother and sister from the same litter…our “twins”. Just the sound of the car pulling into the driveway, is ecstasy. Rosie is always there with her ball, stick, or fragments thereof, full of drive and enthusiasm. Zac is inclined to whimper when a door closes on him but he doesn’t forget how to wag his tail. It is no coinsidence that we have three dogs in our family and if we lived on acreage, there’d be a fourth…one each. They are simply the best! This entry was posted in Australia, Books, Compassion, dogs, Love, Parenting, weekend coffee share and tagged Black Sunday, Bondi, Bondi Surf Lifesaving Club, chef, cook, cooking, disability, masterchef on August 6, 2018 by Rowena. Boat was the only way home. A huge fire storm had engulfed Ku’ring-gai National Park, and jumped across the M1 Motorway, burning out the trains and blocking all traffic in and out of Sydney. Dave was trapped, just like millions of nameless commuters jammed into this hellish sardine tin of burning embers. Yet, like a bat out of hell, he had to get home. She’d never leave the house. Would rather go up in flames, than face her fear. Dad’s dingy would never make it across the Hawkesbury, but he had to try. Only love could find a way now. This has been another contribution to Friday Fictioneers hosted by Rochelle Wishoff Fields. This week’s PHOTO PROMPT © Fatima Fakier Deria. Bushfires are quite a normal, anticipated events, especially during a blazing Australian Summer. It is not uncommon for the M1 Motorway, the only main road North out of Sydney, to be closed due to bushfires and on such instances, the trains are likely to be down too leaving stranded commuters to crash out wherever they can for the night. My husband has been caught up in these closures, although our house is nowhere near the bush. If you are wanting to read a first hand account of driving through such fires, Kimberley’s Bushfire Diary is worth checking out. This entry was posted in Australia, Chronic Illness, Friday Ficioneers, Love and tagged agoraphobia, bush, bush fires, Bushfire, bushfires, fear, National Park, phobia, phobias, Sydney, terror on June 20, 2018 by Rowena.